Discussion in 'Handbags' started by thecoveted, Nov 20, 2009. Coach is doing a campaign with 30 Bloggers, I had the opportunity to style 3 items from the holiday collection with my wardrobe. 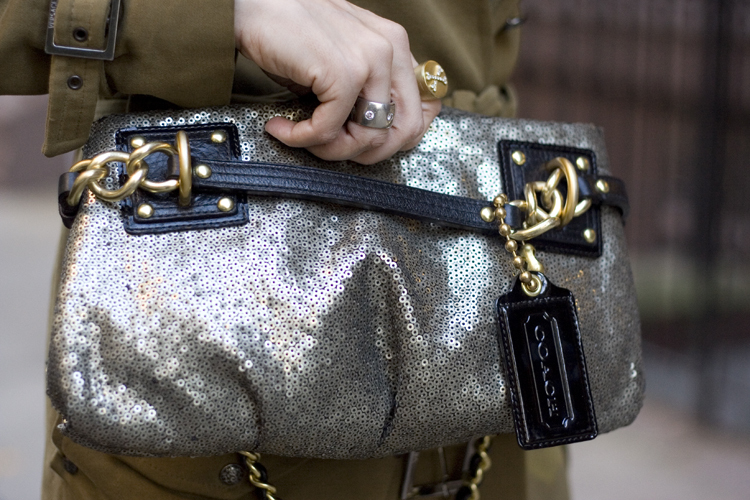 the sequin clutch is super cute! oh, the third 'bag' was a pair of motorcycle gloves... i decided to use that instead. wasn't sure if the moderators would allow gloves in the handbag forum. ooh, and the Audrey... I LOVE it...been using it every day for the last month, and it's really versatile. you look really good on those photos, my favorite is the first! super cute! Love the idea of the campaign (I really think Coach has been stepping it up for the past 1-2 seasons) and your styling! Were the motorcycle gloves yours or Coach? I LOVE them. I've been looking for the perfect short gloves. Please tell me they aren't vintage or hard to find! eta: I see they are Coach! Do you have any idea on the price point? I can't find the gloves on their website.